Don’t worry. It was probably for medicinal purposes, and the pilot has much more to offer viewers. Roswell, New Mexico is a reboot 2002’s Roswell, which was an adaptation of the young-adult book series, Roswell High, by Melinda Metz. The books and TV series have obviously been around for a while and have gotten plenty of attention, but I’d never heard of it. I watched this pilot with zero expectations, only knowing it was about aliens, and honestly? I’m glad. It’s genuinely more exciting to watch a pilot when it’s your first time being exposed to the material. So, this review will be from the perspective of a newbie. Fans of the original series and books will probably have differing opinions. Directed by Julie Plec and written by Carina Adly MacKenzie, this pilot hits all the right spots and is a promising entry to an entertaining drama series. The episode follows Liz Ortecho (Jeanine Mason) returning to her hometown of Roswell after being away a decade for her high school reunion. 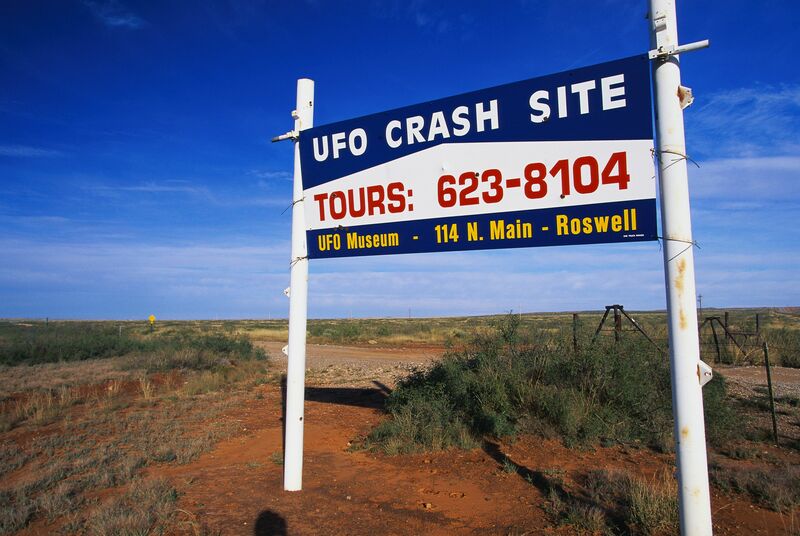 Oh, and it’s a bit important to note that her hometown is the site of a UFO crashing in 1947. Anyway, Liz sees some friends she hasn’t seen for some time, like her ex, Kyle (Michael Trevino) and her best friend, Maria (Heather Hemmens). She also reunites with some friends that are far more interesting like the smitten Max (Nathan Dean Parsons), the stubborn Isobel (Lily Cowles), and the rebellious Michael (Michael Vlamis). All siblings with good hair and act weird as they harbour some bizarre secrets (like, they’re superpowered aliens bizarre). This isn’t really a spoiler because the trailer and premise gave it away, but it still earned a hearty “Oof!” from me, so I think the show is off to a great start. Liz (Jeanine Mason) and Max (Nathan Dean Parsons) standing in the beautiful New Mexico (Courtesy of The CW). With unrequited love, small-town secrets, and life-altering truths, the show is clearly targeting the young adult audience—which The CW majors in—and it doesn’t try to hide it, which is pretty reassuring in a sense. Fortunately, it doesn’t seem to be limited to this audience at all because it touches on relevant issues that concern people of all ages. The writing unabashedly calls out the not-so-subtle racism we see in America’s sociopolitical climate today. Roswell is near the American/Mexican border, so immigration politics is a common and charged topic in the small border town. The show does not shy away from mixing themes and issues with political “aliens” and actual space aliens. In the first few scenes, we see Liz speak out against ICE and point out the regressive nature and stupidity of building a wall at the border. More broadly than that, the whole town seems to have this anxiety about illegal aliens, but little do they know: the literal aliens are just three white people. This setting raises the stakes for Max, Michael, and Isobel; if humans are eager to abuse and dehumanize people from across the border, just how bad will it be when they realize there are beings from outer-space walking among them? The pilot episode does its job by leaving us with doubt and raising a few questions. Do we really know all the secrets the characters are hiding? Can we trust this character or that character? Is this character even a good person? What were they doing for the last decade? These are pressing questions that shall carry us through the show, and the pilot does a good job setting up compelling characters and interesting dynamics to dissect throughout the season. Let’s just hope the writing doesn’t falter (as that seems to be the case for a few of The CW shows). The pilot was written by showrunner Carina Adly MacKenzie, directed by The Vampire Diaries creator Julie Plec, and starring Cuban-American actress Jeanine Mason. In an industry dominated by white men and white lead protagonists, it’s refreshing and necessary to see a change of pace by simply acknowledging marginalized people are just as talented, and have a right to be center stage. Yes, MacKenzie and Plec are white women, but the show just feels inclusive and authentic with everything from race to sexuality. It’s nice to know that Liz Ortecho now reflects her literary roots as she was Latina in the novels, and this was not the case in the original series. However, Shiri Appleby’s Liz Parker still holds a special place in a lot of Roswell fans’ hearts. Liz Ortecho has a perspective that only a Latina woman can have which will inform a lot of her decisions regarding her own family and romance with an alien. That’s a perspective that Liz Parker could not have. All in all, I would have never expected such a niche show like Roswell, New Mexico to become my new must-see every week show, but it just might be. I’m tuning in to see next week’s episode on Tuesday, January 22 at 8:00 EST/9:00 CST. Will you? If you haven’t seen the pilot yet, you can catch it here! 20 year old junior at JMU, class of 2020 in Virginia. Writing for Geeks of Color. My friends call me Stark, so you can call me Stark. Nothing but love.